It's 9:30 p.m. on April 15, 1974. At lottery parties being held in homes all across Canada, folks cross their fingers and kiss their $10 tickets. They watch with bated breath as the winning numbers for Canada's first national lottery are announced live on CBC Television. In the end, nine lucky ladies from Quebec City share the jackpot of $1 million tax-free -- making it the world's biggest lottery payout at the time. Twenty-five thousand others claim prizes ranging from $100 to $500,000, totaling over $8 million. The federal government's decision to institute Olympic Lottery Canada is controversial. But faced with the biggest Olympic deficit in history, the government sees the lottery as a good way to raise cash for the 1976 Montreal Olympics. The gamble pays off. Two and a half million lottery tickets are sold in the first round (there would be eight more), generating over $15 million for the Montreal Olympics and amateur sports. • The winning number to the first Olympic Lottery Canada was 3093734. • The Olympic lottery draw was televised live on CBC Television under the title of Mission Million...Possible. The show was televised simultaneously on both the French and English networks. Performers including Indian musician Ravi Shankar, opera star Maureen Forrester and sports stars including Maurice Richard and Barbara Ann Scott completed the 90-minute broadcast. • A 48-year-old accountant from Guelph took home the second prize of $500,000 -- making him the biggest single winner. The third prize of $250,000 went to a corporal in the Quebec provincial police. • In 1973 Montreal mayor Jean Drapeau promised that, "The Olympics can no more have a deficit than a man can have a baby." Despite Drapeau's confidence and the revenue generated by the Olympic Lottery Canada, the 1976 Games ended up being a financial disaster for Montreal. • The original price tag for hosting the Olympics was estimated at $310 million but with interest, the debt ballooned up to an astronomical $1.5 billion, placing Montreal in debt for decades. • 1841: Joseph Seagram, one of Canada's most prominent entrepreneurs, is born in Fisher's Mills, Ont.. He founded Seagram's in 1883, which becomes a leading producer of whisky. • 1995: A deal ending a turbot fishing dispute between Canada and the European Union is reached. The agreement gives Spain and Portugal a higher turbot quota in return for tougher quota enforcement measures. Road warriors: can bikes and cars share the road? Is the road big enough for both motorists and cyclists? A 1990 CBC documentary tries to find out. Wildly popular on the stage and the comics page, cats have really caught on among Canadians. Stumped by having nowhere to live, a student leaves his housing troubles behind in 1982. 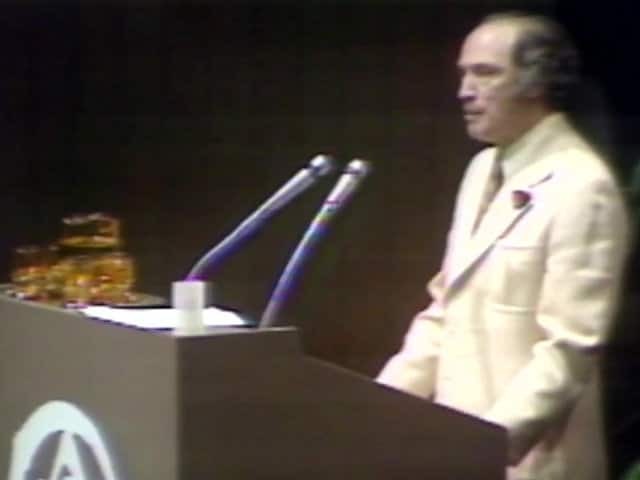 Prime Minister Pierre Trudeau speaks as the conference called Habitat I gets underway. Paul Soles and Adrienne Clarkson explore the sense of touch. Mrs. Macdonald shows CBC's Bill McNeil her dance moves. The owners of Ontario's Sun Valley Gardens nudist camp chat with Callwood on CBC-TV's Close-Up in 1961. Christian Frontiers: Is it a sin to park illegally? Christian Frontiers explores the question of whether or not it's a sin to park in a no-parking zone. A new look in toothpaste: stripes! The inventor of striped toothpaste talks to CBC Radio about his new invention. Women need not listen: a new radio show addresses the concerns and interests of men. It's the 1958 Home Show, and CBC-TV is there to take viewers through a stylish new model home.